After securing you web applications with SAML is the next step to secure your web services with SAML Sender Vouches ws-security policy, this can be complex because you need to know a lot over the weblogic server configuration and its java security frameworks. 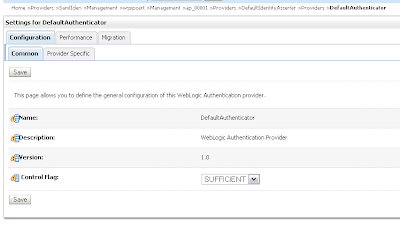 For example you need to configure two Weblogic servers, the first is the Web Service server and the second server is the Secure Token Service ( STS ). 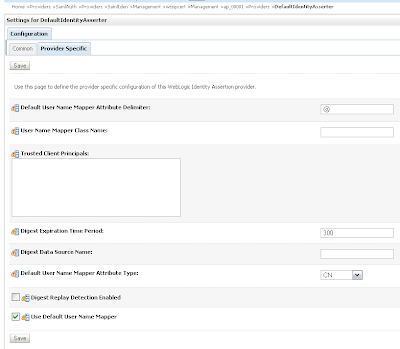 After that you need to add some client credential providers to the generated web service proxy client. Thanks to Vishal Jain of Oracle who provided me a working example. 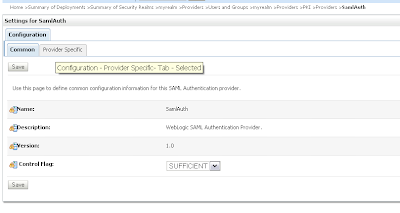 This is how SAML Sender Vouches works and what we need to do in weblogic / java. 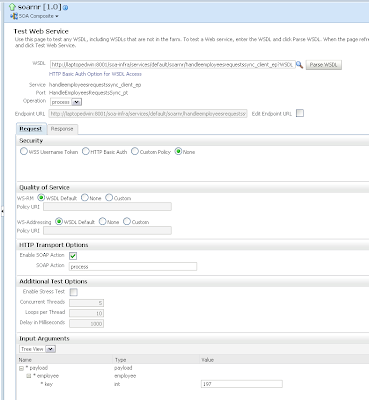 The short version is, the web service proxy client call the STS server to get an SAML assertion on behalf of the User to call the Web Service. The long version, the user provides its credentials to the ws proxy client and the ws proxy client calls the STS server and provides the username / password of the user and the client key. The STS validates the user and the ws proxy client certificate and the STS returns the STS identity assertion to the ws proxy client. 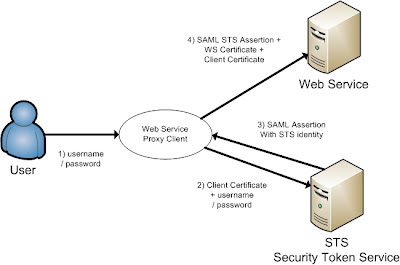 The ws proxy client uses this STS assertion together with the ws client and ws server certificate to call the web service. First we need to have 3 certificates, the first is alice, this will be used in the ws proxy client and the second certificate is bob, this will be used in the Weblogic web service server and the last we use wssipsts certificate for the Weblogic STS server. Add these keys into a java keystore. 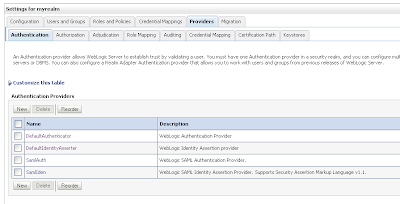 Create a new Weblogic 10.3.1 domain and start the admin server. First we need to enable SSL in the general tab of the server and then add our keystores in the keystore tab. Go the myrealm security where we add the Alice user and provide a password, Very important the username must match with the CN of the Alice certificate. The user provides the credentials and must match with user in WLS and the ws proxy client provides the Alice certificate and this must match with the PKI Credential mapping. 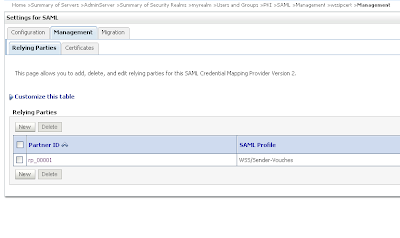 Go to the Credential mapping tab of the Provider tab and add a PKI Credential Mapping where we import the keystore and Add a SAML Credential Mapping version 2 where we add the Web Service URL. 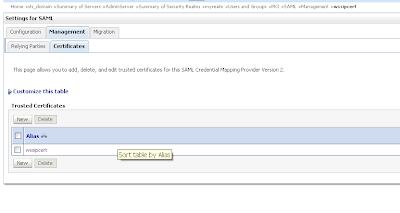 Open the just created PKI credential mapping and add the keystore. 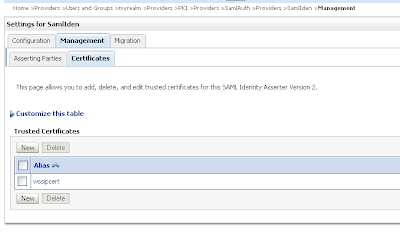 Next we open the SAML Credential Mapping version 2 and provide the Issuer URL and Name Qualifier. That is all for the STS server and now we can deploy the STS web service. 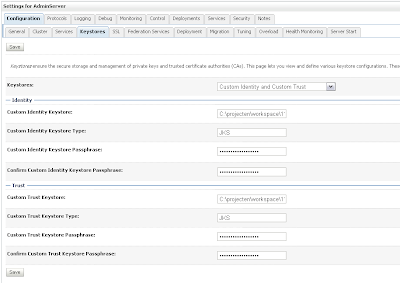 Create a new Weblogic domain and use the same keystore, we don't need to setup SSL on this server. We need to add 2 authentication providers and change the 2 default providers. 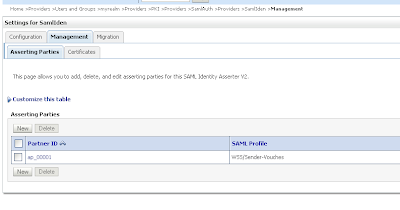 Create a SAML Authentication and SAML Identity Assertion provider. Every authentication provider need to have the SUFFICIENT control flag. Change the just create Sender-Vouches asserting party. 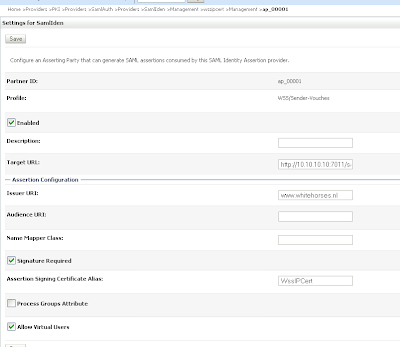 Enable this and provide the target url of the web service and add the issuer url, signature required and expect the STS certificate and allow virtual user. 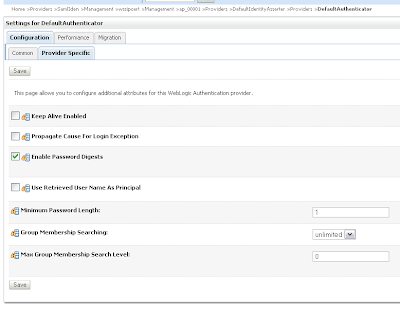 Change the defaultIdentityAsserter and add wsse:PasswordDigest and X.509 as active types. 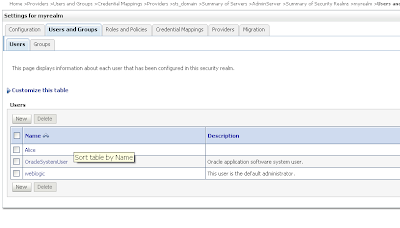 In the provider specific tab we need to set CN in the Default User Name Mapper Attribute Type and enable Use Default User Name Mapper. And in the provider specific tab. Enable Password Digests and Minimum Password Length to 1. That's all for the Web Service server. Now we can deploy the webservice. 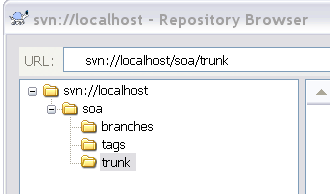 The last step we need to generate a web service proxy client and add the username and the client credentials mappings. 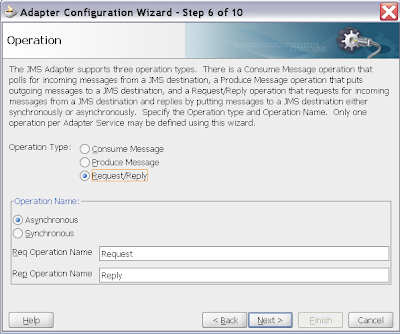 In Soa Suite 11g the JMS adapter has support for request reply operations. You can use this operation in synchronous or asynchronous mode. In this blog I will show you both modes. I start with a Asynchronous example and at the end I describe the synchronous mode. First we start with a simple Asychronous request and reply JMS adapter. Add a JMS adapter to the references site of the composite. 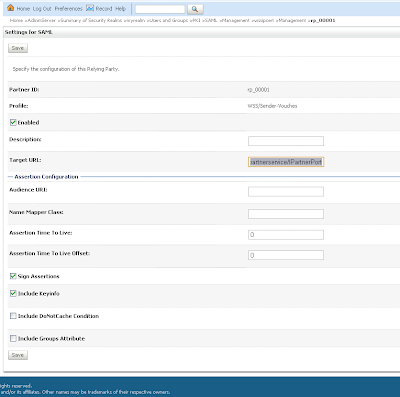 Select a request queue ( need to create this in the wls console ) and provide the jndi name of jms resource adapter ( define this in the jms resource adapter ) . 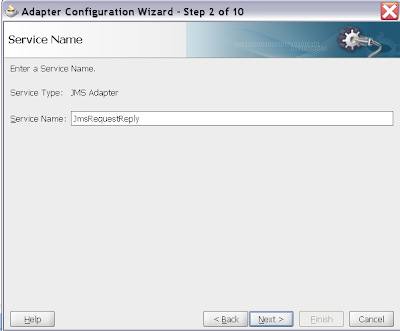 Very important use a xa transacted jms connection factory in the jms resource adapter and leave the rest as default. Provide the request and response element. Now we can use this jms adapter in a asynchronous Mediator or in a synchronous BPEL process. Wire the JMS adapter to this Mediator so we can define the routing rules. Because this asynchronous service is hard to test, so I will also make a synchronous BPEL process which calls this asynchronous jms adapter with a invoke and receive activity. For testing we need to transfer the jms message from the request queue to the reply queue. So I add a mediator with a consume and produce jms adapter. 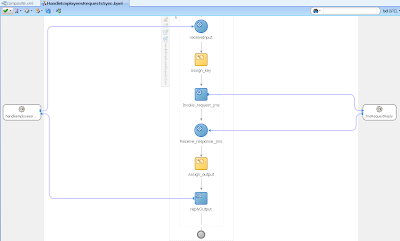 Very important, we need to assign the message id of the jms message to the correlation id of the reply jms message. Do this in the assign of the routing rule. 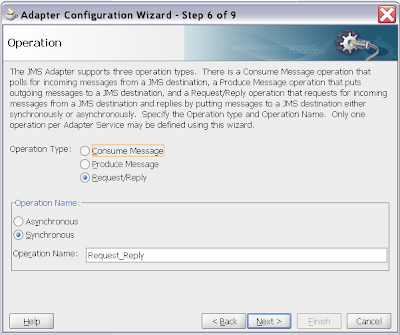 The synchronous request reply jms adapter works a bit different then asynchronous. 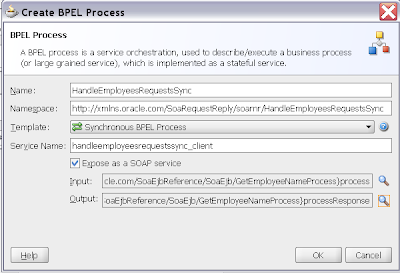 In step 7 we can provide the request and reply queue. 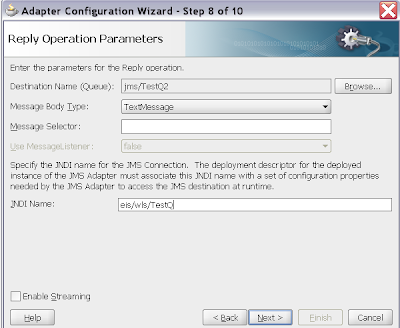 But very important we to provide the jndi name of a jms resource adapter which has transacted on true and use a jms connection factory which is not xa transacted. 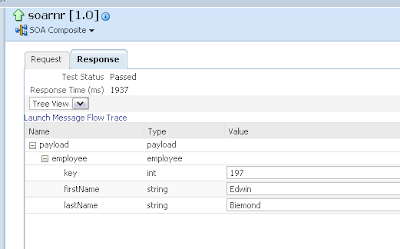 With synchronous jms adapter I had to switch the request and response element. Very strange ( is it a bug ). 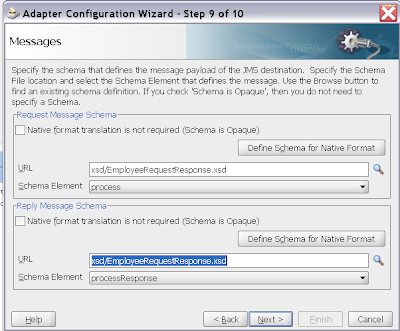 This synchronous jms message is a bit different, this message has the JCA_JMSReplyTo field which contains the reply queue name. Now for testing we also need to add an extra mediator with reads the request queue , set the correlation id and put the message in the reply queue. 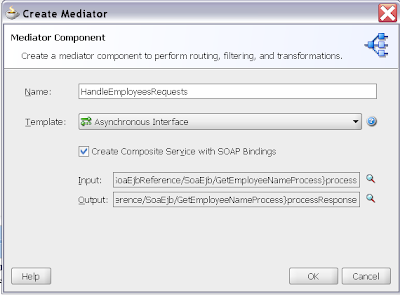 Add a synchronous mediator and wire to the synchronous jms adapter, complete the routing rule and finally test this in the enterprise manager. Here is my quick overview of the features and products I noticed at OOW. 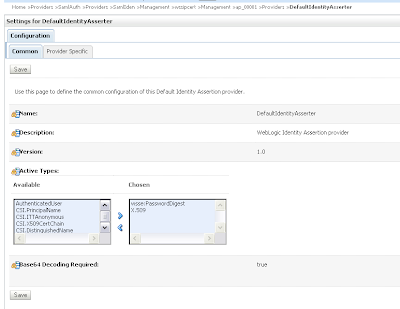 - Oracle improved the ADF Event mechanism, so the Task Flow fragment regions can communicate much better, You can define the event on a JSF item and not manually in the pagedef, define your own payload. 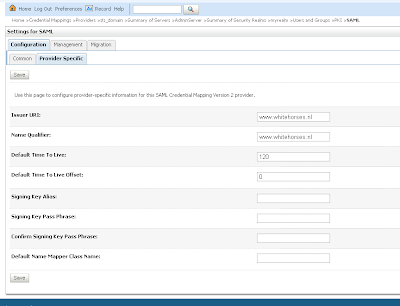 For example in an ADF tree with employees and departments you can send an event when the user select an item in the tree and this number will be passed on to the right task flow. And you even can fire events with drag and drop. For more info buy the coming book of Frank Nimphius, he wrote a whole chapter about this subject. 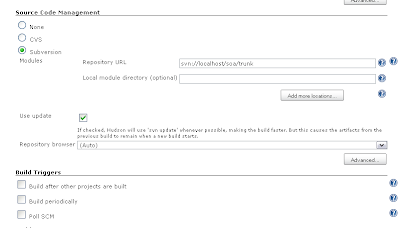 Build your web application just like a normal ADF web application on deploy this on weblogic server. These mobile jsf pages which work on every phone in the native look of the phone, the so called the browser version. With mobile you can also build native applications for blackberry and windows mobile ( just make the right deployment profile ) and this will work with the black berry and windows mobile services and these services will sync with the oracle lite server. So this technology makes it possible to make an offline ADF application, when there are enough customers who wants this feature then Oracle will build this. ADF mobile is now only supported with ADF BC and the next versions will have also have web services support. -The soa suite is becoming more and more complete, the next version will have a spring context component, this component is in this version only available as technical preview. But this is a good start and there are talks about supporting C code in the composite. 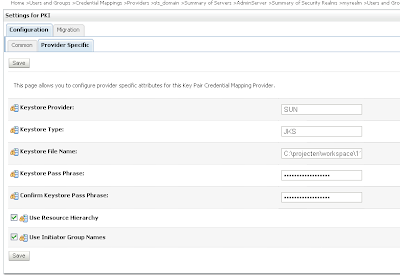 - EDN Event Delivery Network now only works with AQ but there will be also a JMS implementation. 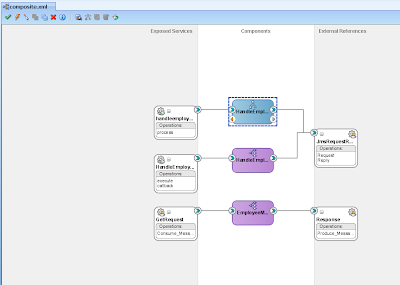 In one of the hands-on sessions we could play with BPM 11g and it is really great. 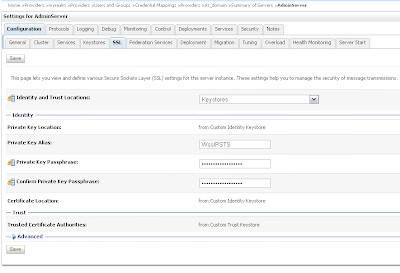 You can now use JDeveloper to configure it and BPM is an composite component in the Soa Suite. So you can take a look or change it at the BPM level or go to the composite level. 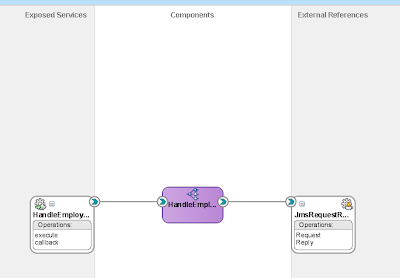 BPM uses the human task flows components of the soa suite for the human interaction, Next we can import this human task in jdeveloper to create an task flow which can be deployed in the worklist application. 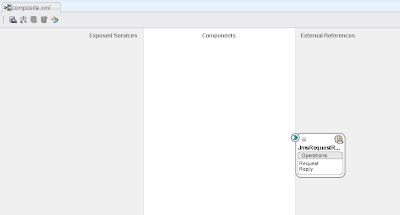 And BPM introduces the BPM composer which is a web application ( don't need jdeveloper ) where you can change your process. Oracle thinks to release it early 2010. With Soa Suite 11g we can add unit tests (test suites) to our composite applications and start these tests with the ant scripts provided by Oracle. The soa test ant script can start and generate an junit xml which can be read for the result of the test. 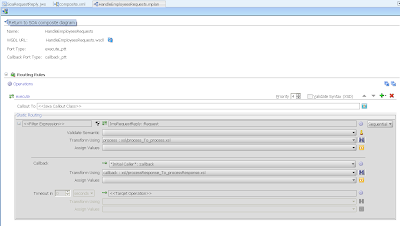 For more info see my previous blogpost about the ant scripts and the testsuite option in Soa Suite 11g. So the last step is to combine the test suite feature and the ant scripts of mine and Oracle so we can use it in a continuous build system. I will use Hudson for this. We start by downloading the lastest hudson war. 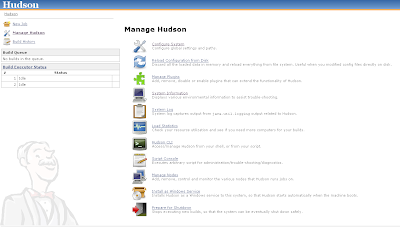 this will start Hudson and open a browser and go to http://localhost:8080. Provide the ant and java location of the jdeveloper 11g R1 home. This is how it looks. Very important my ant scripts need this folder paths. Now we can create a new job. Configure this new job. We start by adding the svn url. Then add the ant script ( build.xml ) and fill the target ( deployAll) and for the oracle ant scripts we need to set the basedir java parameter to the jdeveloper bin folder. 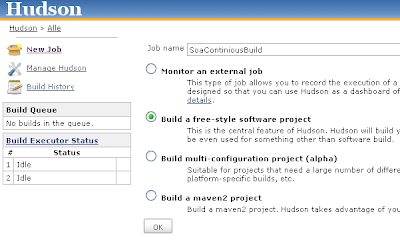 And provide the location where Hudson can find the junit xml files. I need this for the ant scripts so I can use relative paths. Let's press build now and look at the result. My example composite application contains two tests, in my case they are both succesfull. That's all. This will save you a lot of testing time and off course Hudson can blame the person who checked in as last.